providing a regular, safe, friendly, fun & sociable meeting place. 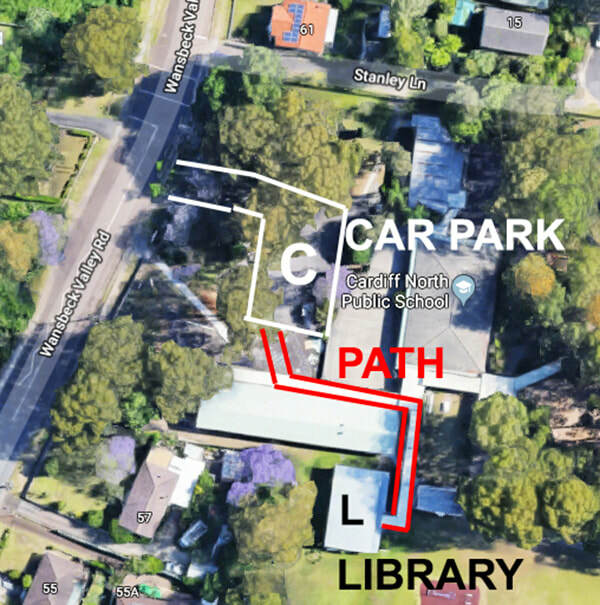 ​ will be held at Cardiff North Public School Library – 59 Wansbeck Valley Rd. A group of our regulars, plus another new volunteer, gathered in the cool school Library on a not quite so hot February Sunday, for another of our 2019 Boomerang Bags Sewing Workshops. Once again, several of our volunteers had been busy at home over the past month, and arrived, or sent in, new shopping bags which they had sewn. By the end of this workshop, another 35 bags had been added to our collection. Our regulars are great people to spend some time with, and the camaraderie in the group is beginning to really develop. Anna from The canopy announced another new innovation - MONDAY DROP IN AND SEW. If you are unable to make the Sunday Workshops, please consider the Monday Drop In sessions being run by Anna and The Canopy. If you are unable to attend either the Workshops or Drop Ins for the full time, at least drop in to either, and pick up fabric and patterns, sew some bags at home, and return at the next session with the completed bags. The Workshops and Drops Ins are a great way to meet local people in a friendly and supportive environment. The 6 months of monthly Boomerang Bags Sewing Workshops ended on a high note. As had become a pattern, regular attendees arrived on the day with piles of finished recycled-fabric shopping bags, which they had sewn at home during the past month - I’m hopeless at keeping count, but there must have been about 25 to 30 bags. Another 10 to 15 were completed at the final Workshop. Lidija, who is a member of Redhead Sustainable Neighbour Group, took a number of finished bags, along with copies of printed “how to sew bags patterns”, which she will sell and give away at the Redhead SNG stall at the Redhead SLSC Xmas Fundraising Markets on 12th December. Lidija was impressed with our Boomerang Bags efforts at the CASNG Car Boot Sale, and wants to repeat that at Redhead. Anna from The Canopy, who has very ably looked after the sewing side of things, continues to find important uses for the bags that are made - with many being used to distribute food parcels to needy families - previously, donations would most likely have been handed out in plastic bags. 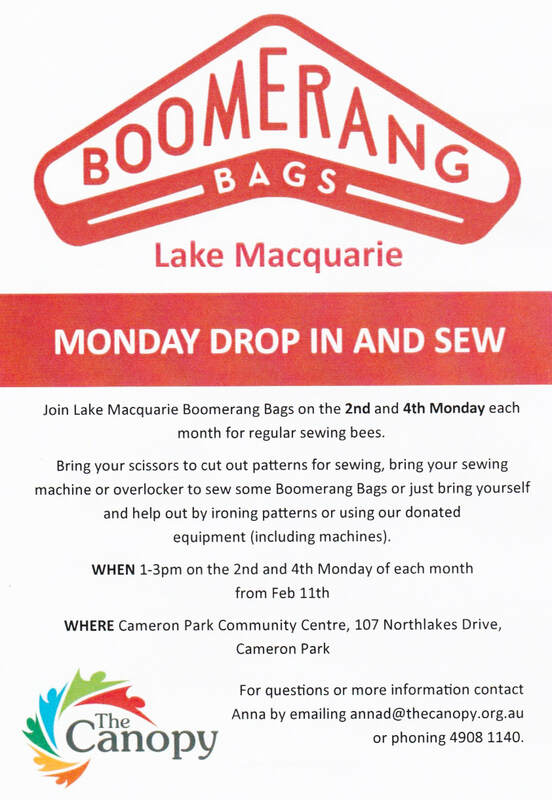 CASNG and The Canopy have made important contributions to cutting the use of plastic in Lake Mac. Feedback from participants was overwhelmingly positive, with everyone rating the Workshops, 5 out of 5. They loved getting together with like minded people - “wonderful camaraderie”; “learning from others”; Doing something positive to help the environment & the community”; "sharing ideas”; “very sociable”; “great morning tea/lunch”; “positive atmosphere”; “companionship” - are a selection of some of the comments. Where they found out about the Workshops is an interesting result – 50% from the Eco Advocate; 40% from the Newcastle Weekly; 10% from the CASNG Newsletter. The only negative note - “don’t schedule Christmas events on the same day” - was something CASNG certainly hadn’t originally planned, and can easily be avoided next year. Kiani, and her mother Kim, are an inspiration though - after attending the Beeswax Wrap Making Workshop in Cardiff South earlier in the day, Kiani & Kim dropped over to Cardiff North to leave the 5 shopping bags Kiani had sewn at home over the past couple of weeks. All of the attendees were very keen to continue attending Monthly Workshops in 2019, and consequently, CASNG and The Canopy will hold Monthly Workshops on the last Sunday of each month, January to November, in 2019. Anna from The Canopy has done a fabulous job bringing supplies of fabric and thread to the workshops, getting fabric cut to shape, and in distributing the completed bags - I wouldn’t have been able to run the Workshops without her help – many thanks to Anna. But in particular, a big thank you to the 22 community volunteers who contributed their time and talent, to help make Lake Macquarie plastic bag free. AND EVERY MONTH, TWO OR THREE NEW VOLUNTEERS ARRIVE TO HELP OUT. CASNG and The Canopy would like to sincerely express their appreciation to all of the participants for their hard work on each day, and for their continued efforts to make more bags – they are an inspiring group of people. Eventually, any shopping bags produced will be made available to the community to use. If you would like to help keep the flow of more reusable, fabric shopping bags happening, attend the next Workshop, or just click HERE and let us know if you would like patterns or fabric to get you started at home.